It was really an awesome journey for us. I never knew that it would be so easy to travel to Bangalore by car! We started early morning around 5 O' Clock and we reached Bangalore EC by 10 O' Clock. But Whats special there? We have my Anna's house warming ceremony tomorrow!!! It was just 4 hrs journey and we took break for breakfast for about an hour. Thamizhini was asleep when we started from house but she woke up when I put her in the Car. She did not sleep for about an hour but later she slept in my hand itself. Once she woke up, sky was very clear and she was so happy to see here and there! She did not really feel boredom to sit in the car itself. We stopped for her to have breakfast by 7:30 but she did not have it and started playing in the car. But when we had breakfast in hotel, she also joined us and tasted Pongal nicely from Saravanabavan. I'm Happy to see Rishmy akka!! The plan is to reach Anna's house and stay for sometime. Then take bath and start to Benazir's house in the evening around 3 or 4. 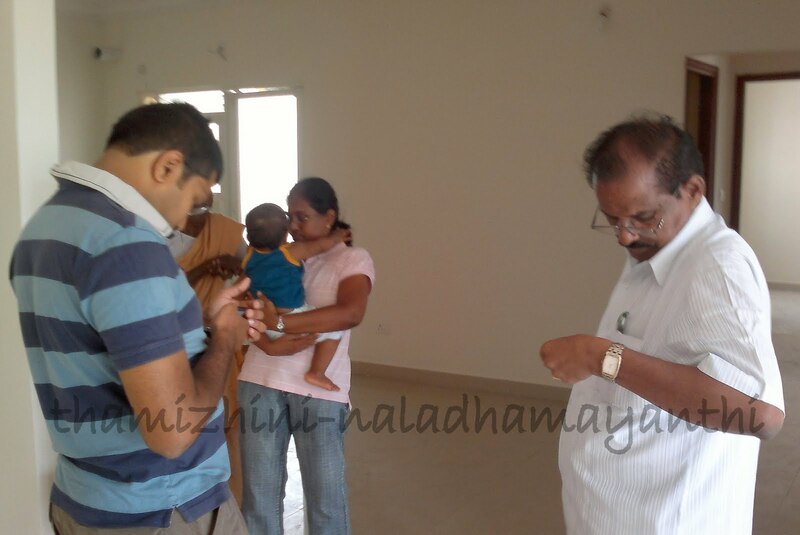 So after reaching Anna's Apts, we explored the house and took rest for sometime there itself. After that we marched to the Guest house which he booked for us. And there starts the music!!! 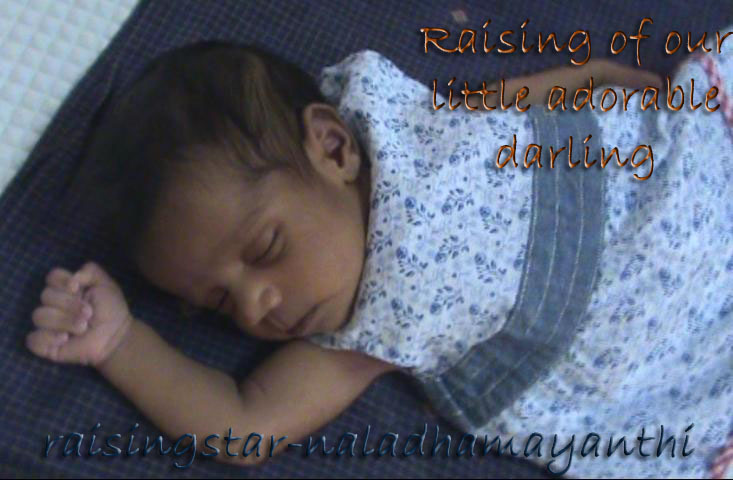 Thamizhini does not like to sleep in bed! does not like to take bath! does not like to have food! hmm... she was changing herself as Torture Thamizhini!!! Somehow I made her to take bath and fed food! Meanwhile my friend Bena was giving messages and asking when are you coming! when are you coming! message me once you start! ( I was not knowing why Bena is messaging me these many times until I knew the original reason. 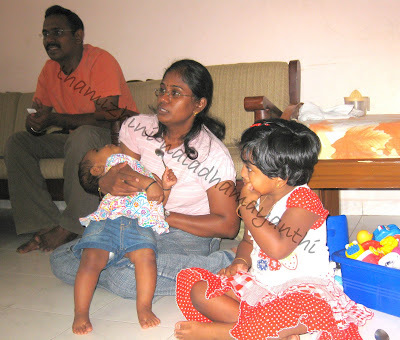 Follow the link to know about it -> http://rismiya-farhana.blogspot.com/2011/06/happiest-sunday.html. We took NICE road to reach Bannerhatta road and reached her house in 45mins. and when we reached it was 5 O Clock. :-( And I was thinking myself that I have to leave Bena'shouse at least by 6:30pm. Akka ku evlo hair and clip kooda azhaga iruke! Now I 'm remembering myself that how one and half an hour passed! It just went like a second! Rishmy had collected all her toys and kept ready for Thamizhini to play. 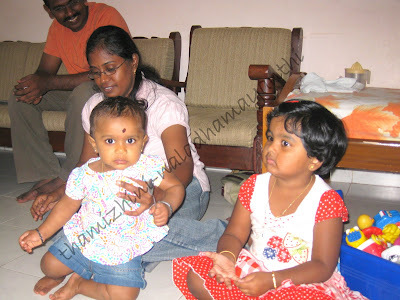 Thamizhini was so happy to see all toys in one place and started playing with that. 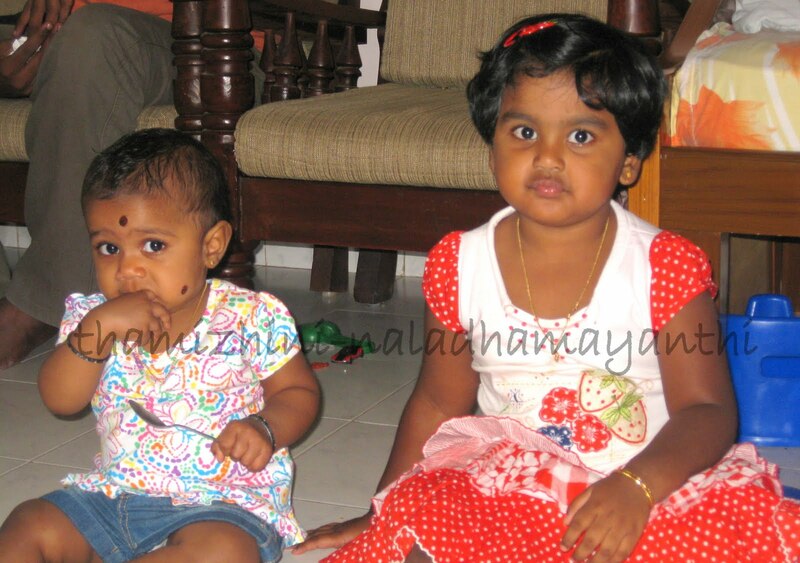 Rishmy is thinking: Evlo toys koduthalum eh epdi kurumbu panra? I could see Rishmy's happiness in her action itself, running here and there and showing all toys to Thamizhini and calling her "Kutii Kutti..." Mind blowing... Rishmy is just 3 years old and she calls Thamizhini as Kutti! What an affectionate word that is. We love you Rishmy darling! While we were driving back to guest house, me and Nalin were talking about Rishmy only. Rishmy gave a gift to Thamizhini and told her not to open it here :D I was just wondering myself that who is teaching all these to this small kid. We obeyed her order and did not open the gift there. Even Thamizhini liked that golden color wrapper and was very happy to hold it in her hand while coming back to house. And any idea, What was it??? 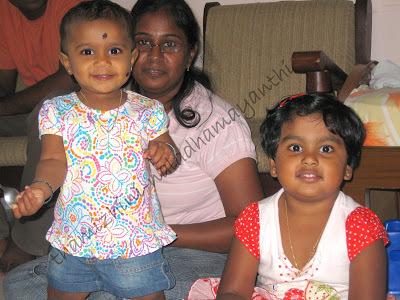 Thanks Akka... and Aunty Pose ok va? Check out the below video too! We wondered by seeing them how these Two little cuties behave in front of camera and surprised by seeing their pose and they remained same until Bena clicked the above picture. And What about Bena & Safi! 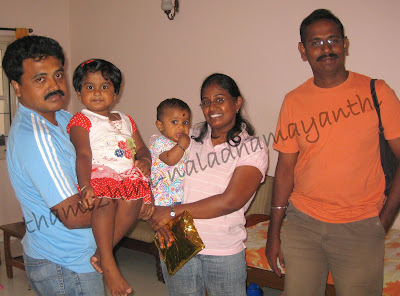 Nalin met them for the first time but it never looked like that! as we always used to talk about them! Super Lady Bena prepared Bread Bonda and Onion Bajji in a minute and that tasted heavenly! Also the Carrot halwa with lots of Cashew nuts! I could feel the taste even now, it is just lingering in my tongue. Finally set for bye bye...!!! It was an excellent evening and unforgettable get together! But I missed one thing there! I wanted to meet my another best friend Swapna! I was not able to make it because we had to start as there was some pooja in Anna's house and even Thamzhini was very cranky! I'm really expecting to meet all my friends like this! But don't know when! Really, its an excellent and unforgettable gathering. Hope we could meet once in a year. Once you people left, Rismi didn't stop talking about Thamizhini. She was talking, talking till she fell asleep :). 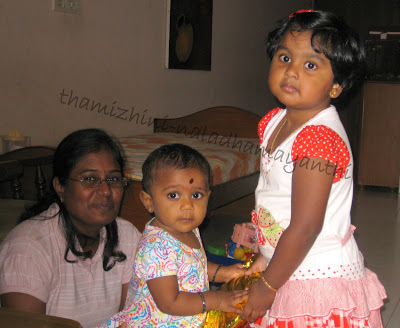 Till now, she is asking when will Thamizhini come again to our home ? Bena, Yeah we have to meet at least once in a year! And now its your turn to come down to Chennai! Rishmy kutti, ask amma n appa to take you to Chennai! :-) Bena, show this to Rishmy!! !